If you are going to make lemonade, you might as well get creative. Try this watermelon rosemary lemonade if you are looking for a refreshing alcoholic drink. Or for the non-drinkers, you can leave out the gin or simply add fresh mint to your favorite lemonade to give it a little kick. You can freeze fresh-squeezed lemon juice in ice cube trays to preserve in small amounts. It's nice to have on hand when you forget to buy lemon for a recipe and don't want to go to the store for one item. While you don't need a recipe to make a great sangria, you do need lemon. It's also nice to serve it with a few slices in the glass or on the rim. When I worked in produce, we would squirt some lemon juice in the sinks or over the compost whenever there were some funky smells in the prep room. To remove odors from garbage disposals, you can drop in leftover lemon peels (make sure the pieces are small or they will get caught). Rub lemon juice into cutting boards that have retained strong odors or stains, and clean with soap and water. For the fridge, pour some lemon juice on a sponge or cloth and place it in the fridge until the smell goes away. Similar to Citrasolv, lemon juice works as a natural household cleaner. You can use lemon juice or squeeze a lemon directly on kitchen or bathroom surfaces, and wipe them with a wet cloth to remove the sticky residue. For stains and really dirty areas, mix in some vinegar and water with the lemon juice. For dry skin, you can use a lemon-sugar scrub, or rub a cut lemon on particularly dry areas, such as knees, elbows, or heels. Be careful when applying to cracked skin. You can also make your own detoxifying body wash with this recipe for sea salt and lemon body cleanser. It may take a little extra scrubbing, but you can remove water stains, soap scum, and limescale naturally with lemon juice. Use a lemon, water, and vinegar mixture for tough stains on your shower walls or tub. You don't need bleach or chemicals to brighten your whites. Try using lemon juice instead of detergent for cleaner and naturally scented clothes. Lemon juice is also good for removing stains. You can directly apply lemon juice to the spot before washing it, or for bigger stains, it is recommended to soak the clothing in a 50/50 mixture of baking soda and lemon juice. There's nothing like a Hot Toddy for a sore throat, but you don't have to have the whiskey. A freshly squeezed lemon in a cup of hot water will also do the trick. I like to add honey, which sweetens the drink and is another natural germ killer. For fresh-cut fruit or veggies, squeeze a fresh lemon over them to prevent browning. This is another reason many guacamole recipes call for lime; in addition to the flavor, it keeps the guac from turning brown when you store it. Believe it or not, you can use lemon juice instead of harmful weed killers to get to those hard-to-remove weeds that always come back, particularly in the cracks of your sidewalk or driveway. For more efficiency, put the lemon juice in a garden hose filter, and soak the area thoroughly. For natural hair highlights, use lemon juice directly on your hair before going out in the sun. There are many different suggestions for how much lemon juice, but it depends on the hair. You may have to experiment to see what works best for you. But always wash your hair afterwards. Like hair, nails can be brightened with a little lemon juice. Again, there are many recipes for whitening nails; however, if you find a recipe online that also recommends using lemon to whiten teeth, I would not recommend lemon for this. My mother worked for a dentist for a long time, and she said that the citric acid is too harsh on the teeth and gums. You can also mix a teaspoon of baking soda and a few drops of hydrogen peroxide on a toothbrush to get the same results, but keep in mind it will take a few applications to notice a difference. Yep, notes. A friend of mine has two children who like to leave notes or little poems on lemons. I'm not sure why, but they love it, and it's cheap entertainment for mom. Lemon juice works great to cut the grease on dishes if you don't have a dishwasher, but you can also use lemons in the dishwasher (in addition to dish detergent). Place a cut lemon in the top rack of the dishwasher to get that Jet-Dry clean, but make sure you secure it so that it doesn't fly around during the wash. I used to buy an expensive stainless steel cleaner until I heard that I could just use a little salt and lemon juice. Make sure you wipe the steel down with a clean cloth afterwards. You can use this on most metals, but it is not recommended for silver or gold. Spray lemon juice around the areas that you see ants in your house or outside in the places where you think they might be getting into your home. Recently, someone invited me to dinner, and she had roasted a chicken with an entire lemon inside of it (cut in half). It was the most tender chicken I've ever had; she told me that the lemon was the key. You can also mix lemon juice with your favorite herbs and rub it under the skin to add moisture and flavor. And freshly squeezed lemon is a classic pair for any kind of fish, grilled or broiled. Any time I make a salad dressing, I add a small amount of lemon juice to enhance the flavor and also preserve it longer. A good basic vinaigrette to have on hand is lemon, balsamic vinegar, and oil. The portions depend on your tastes, but typically a vinaigrette has more oil than vinegar (olive oil is best), and a small amount of lemon juice. Lemon zest can be used in many recipes, but it also makes a nice garnish. If you are looking to gussy up that centerpiece and don't want to spend a lot of cash, lemons add a lot of color to the table and can be used with many other decorations. Try putting them in a large clear bowl for something simple, or place them in a basket with some fresh herbs for a holiday decoration. There are so many luscious desserts that use lemon from meringues to pies; lemon is a classic dessert flavor. You can also use lemon instead of lime in some recipes. I replaced the lime with lemon zest and lemon juice, and turned lime and coconut crumble bars into lemon bars. Very tasty! From soda and seltzer to iced tea, a few slices of lemon can enhance any cold drink, even some light beers. While lemon may not be the first ingredient you think of using when making pasta dishes, baked lemon pasta is one of my favorite dishes. Lemon can disinfect germy hands. So skip the hand sanitizer, and grab the nearest lemon. 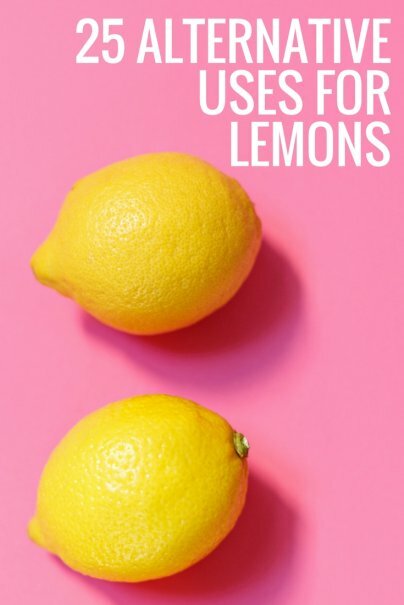 I have always loved lemons, but I didn't realize they had so many uses. I use small pieces of the peeling freshening my garbage disposal, like you suggested. The skin care is a new idea I haven't thought about, a lemon sugar scrub sounds amazing! Using lemons as part of weedkiller and ant repellent are great tips too. I'm bookmarking this article and sharing. Thank you! great article! Didn't know that you can use lemons as hand sanitizer. Also, cute idea with leaving notes on lemons. I have one of those annoying summer colds right now, and I'm drinking hot water with lemon and honey. So nice! I'll occasionally squeeze half of a lemon into a hot cup of tea -- similar to #9 and delicious. #14 about writing notes reminded me of some guys in college who always wrote funny things on their bananas whenever one of the roommates bought a new ones. I've used lemons in a bunch of different ways as a great beauty product. In addition to the ways you listed here, its also a great way to get rid of post-acne scars. Rubbing some lemon on areas of your face that are darkened from acne marks can lighten them.